Synonyms: Boku wa, Onna no Ko, Sweet 16, Shounen no Musume, Boy's Daughter, Rakuen ni Ikou, Let's Go to the Paradise, The Theme of Akemi, The Flower, He said "I'm a Girl"
A collection of one shot stories from Takako Shimura, the author of Hourou Musuko and Sweet Blue Flowers. These stories deal with issues relating to gender, romance, ideals of beauty, and relationships with parents. 1. 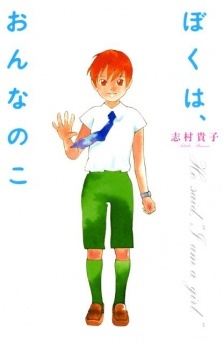 He said "I'm a girl"
The namesake of a play from Shimura-sensei's Hourou Musuko, "I am a Girl" deals with gender identity as well as other important issues. If you've read or seen Hourou Musuko you will recognize the plot of this one-shot. If not, you see a world where everyone's gender have been switched around, and people learn how to deal with gender in an entirely new way. At the turn of the century, we meet Tsukaki-kun who deamt he was a girl - and then he was! He and his classmates, family, friends, and the rest of the world get an entirely new perspective on gender identity - a trans woman is even represented and annoyed her body turned into a man's again. Here we meet a lonely young teacher at junior high. At the moment her unemployed childhood friend is living with her after his most recent breakup. She deals with the expectations put upon her to be experienced both romantically and sexually, and between her teasing childhood friend/freeloader and an off-putting junior high student she learns to take charge and make important decisions for herself. The young teacher in this story comes to terms with who and how she is, and while it's a somewhat odd story, Shimura-sensei get the point forward, and I appreciate what she's saying: "being a virgin doesn't and shouldn't define you". Asako dreams of her previous life and how she got reincarnated as her younger brother's daughter. The story shows her bringing her boyfriend home to meet her family. Dealing with loss and family ties, Boy's Daughter drew me in. Telling a tale of loss, understanding, familial similarities and differences, and communication difficulties, I think Shimura-sensei did a wonderful job. The Theme of Akemi tells the story of three brothers and how they deal with the loss and mourning of their father. We meet Teruo, Yoshio and Haruo and see them understand and deal in different ways. Teruo is a teacher at a girl's school, and old men at the funeral compare him to his father. Through his mourning Teruo jokes and stays casual and strong, carrying on as usual, and I really appreciate him doing this. This is the brother i can most relate too, the one who seems unaffected and shows no weakness. His character is wonderfully captured and his story is realistic. Yoshio shows up at Teruo's door late at night to borrow his mourning suit, having yet to see their father since his death. Yoshio deals firstly by putting things off and in a way maybe denying what has happened, and when he really sees it he starts crying. As well as being a tale of Yoshio's mourning, it's a tale of their father's attitude towards his sons. It's a nicely composed story with good flow and character, and seeing Yoshio mourn as he did was refreshing and familiar. Haruo is bringing his to-be-wife home to meet his parents, and while the stories about his younger brothers are of mourning, Haruo's is one of anxiousness and joy until they go to eat dinner and the unthinkable happens. Haruo deal with things very differently than his brothers, and in a way we don't often see represented in anime and manga, and as refreshin it was to to, it was also sad and difficult. It was well done, and I think it was a good choice for his character. Okayama and Yuki meets on a train (after Okayama tried to feel her up! ), Yuki is being ordered home by her family, Okayama is going to his in-law's to talk things through with his wife. You may recognize Yuki as Yoshida Hideyuki from Hourou Musuko, another of Shimura-sensei's works, and if you do you know that she is a trans woman. She is being called home because she appeared on a TV-show and has to answer to her family. Okayama, however, goes to try and reconcile with his wife after she left him because he cheated not one but twice! The Flower focuses on Yuki and her family, and how some parts of her family accepts her and some parts don't. She is met with transphobia and a generally bad attitude by her parents, and it raises the question of how much of parents they really are, acting as they do towards their own child. But as much as it's a story about transphobia, it's a story about acceptance and how people around her likes her as she is. It's both a story which forces awareness about trans people's issues, and a story of how to be a good ally. This is my favorite part of the manga, and I really think it's captured the truth of life for many trans people. Hina is annoyed (and very tired!) because even her arts club has to run a marathon with the other clubs at school. Hina deals with hidden feelings for her tutor, and unrequited love is the focus of the last stroy. Albeit a common and ultimately overused trope, this is unrequited love with a wonderful twist, and it's wonderful! All in all this is a manga that will make you aware. Some of the feelings you will recognize, some you may not, but you may have to look long before you find a LGBTA+ friendly manga like this! Shimura-sensei has done a wonderful job with the issues she wanted to draw attention to, and she succeeded.